Department of Nutrition, Biochemistry and Toxicology, Defence Food Research laboratory, Mysore - 570011, Karnataka, India. ABSTRACT: Background: Obesity is a confronting global issue with excess accumulation of body fat to an extent that decreases life expectancy. It is multifactorial in origin; genetic, environmental and pathophysiological. It leads to metabolic syndrome characterized by type 2 diabetes, cardiovascular diseases, fatty liver, hyperlipidemia etc. Objective: In this study, we have screened hydroalcoholic extracts of 7 plants for anti-obesity efficacy using inhibitory effect on lipid and carbohydrate metabolizing enzymes as indicators and further screening of these plants in 3T3 L1 cell line for inhibition of adipogenesis. Results: Among the 7 plants screened, Cyperus rotundus and Citrus limon showed highest inhibitory activity compared to other plants. These plants also showed antioxidant activity. Furthermore, these plants were investigated for their inhibition of adipogenesis and promotion of lipolysis in 3T3-L1cells. Cyperus rotundus and Citrus limon at 125 µg/mL showed inhibition of triglyceride accumulation and promoted lipolysis. Conclusion: Over all preliminary in-vitro screening study reveals Cyperus rotundus and Citrus limon showed potent anti obesity efficacy thus these plants may act as alternative herbal approach for treating obesity. INTRODUCTION: Obesity is a swiftly growing epidemic worldwide. Since existing pharma-ceuticals fall short to provide long-term solution due to the adverse side effect. Medicinal plants are known to possess anti-obesity property. Since ancient times, medicinal plants have provided pivotal tool as an alternative approach against pharmacological agents. Medicinal plants act as the anti-obesity agent through various mechanisms such as appetite suppressants, modulators of adipogenesis, anti-lipid hydrolysing enzyme such as pancreatic lipase and lipoprotein lipase, and metabolic stimulants through thermogenesis 1. Obesity leads to the pathogenesis of various chronic diseases, such as cardiac injury, hypertension, type 2 diabetes. Recently countering obesity by exploiting plant extracts has gained popularity due to the adverse side effects of pharmacotherapy. It is known that adipocytes play a pivotal role in modulating obesity by hypertrophy and hyperplasia, conversion of pre-adipocytes to mature adipocytes 2. This condition of the adipose tissue is attributed to nutritional disequilibrium between energy intake and energy expenditure leading to obesity. Adipose tissue regulates whole body energy homeostasis by secreting bioactive substances adipokines which regulate lipogenesis and lipolysis 3. During excess calorie intake preadipocytes are converted into adipocytes and store excess fat as triglyceride and release it during calorie deficit period. This process is highly regulated by adipokines released by adipose tissue. A dysfunction in this process leads to accumulation of excess fat resulting in obesity 4. The present study has been aimed to screen the anti-obesity effects of a few medicinal plants by assessing inhibitory effect on digestive enzymes; pancreatic lipase, alpha amylase and alpha-glucosidase and further inhibition of lipid droplet accumulation in 3T3 L1 cell line. Pancreatic lipase is a major lipid hydrolyzing enzyme converting triglyceride to monoacyl-glycerol and free fatty acids. Inhibition of this enzyme reduces digestion and absorption of fat from food thereby reduces weight gain 5. Thus monitoring this enzyme provides a potential approach for screening anti-obesity agents in medicinal plants. Obesity causes decrease in insulin sensitivity there by leading to type 2 diabetes 6. Targeting digestive enzymes alpha-amylase and alpha-glucosidase which catalyze the conversion of starch to disaccharide and further conversion of disaccharides into monosaccharide’s 7. Inhibition of these enzymes leads to decrease in glucose absorption which provides potential approach for treatment of type 2 diabetes. In a recent study, it has been found that major bioactive compound in plant material are flavonoids and polyphenol which have been found to be potent anti-obesity bio active agents decreasing fat absorption by inhibiting pancreatic lipase enzyme and lipoprotein lipase, increase fat oxidation and decrease adiposity 8. 3T3 L1 a mouse fibroblast cell line is well established as in-vitro model system to study adiposity. This cell line differentiates from pre-adipocytes to adipocyte by accumulation of lipid droplet 9. In this study, we evaluated the inhibition of differentiation of cells with different plant extracts from pre - adipocytes to adipocytes. Our main objective of this study is to screen selected plant extracts for antiobesity efficacy. Chemicals and Reagents: Orlistat, Insulin, Dexamethasone, 3 - Isobutyl 1- methylxanthine (IBMX), Dulbecco's modified eagles medium with high glucose, featal bovine serum, antibiotic solution, glycerol standard and reagent, bioactive compounds, pancreatic lipase type 2 p- nitrophenyl butyrate, alpha-glucosidase, alpha amylase DPPH (2,2 - diphenyl 2H-tetrazolium bromide) ABTS (2,2 azino -bis 3- ethyl benzothiazoline 6 sulphonic acid) were obtained from sigma- Aldrich (MO, USA). All the other reagents were of analytical grade obtained from SRL India. Phytochemical Screening: Preliminary screening was done for qualitative detection of alkaloids, glycosides, flavonoids, polyphenol, amino acids, tannins, saponins, steroids and triterpenoids using the standard procedure 10, 11. Quantification of Total Flavonoids and Total Polyphenolic Content: Polyphenol content was measured by the method by Bursal et al., 2013 12 Gallic acid was used as standard to determine total polyphenol content in plant samples using 0.5 mL Folin - Ciocalteu reagent followed by 10 min incubation later 2 mL of 7% of sodium carbonate was added and absorbance was measured at 750 nm using spectrophotometer (Shimadzu, Kyoto, Japan). The results were expressed in terms of μg (Gallic acid equivalents) GAE/mg of extract. Flavonoid content was measured by Quercetin as standard with different concentration (100 - 1000 μg) and volume made up to 1 mL with distilled water. To this 75 μL of 5% NaNO2 and 150 μL of 10% AlCl3 was added and incubated for 10 minutes at 37 ºC. To this mixture 0.5mL of 1M NaOH and 0.75 mL of distilled water were added and the absorbance was measured at 510 nm against reagent blank. The results were expressed in terms of μg (quercetin equivalents) QUE/mg of extract. Reducing Power: Reducing power was evaluated by using ascorbic acid as standard (1 mg/mL) and plant extracts (1 mg/mL) was taken in different concentration in test tubes and the volume was made up to 1 mL using distilled water. To this 2.5 mL of phosphate buffered saline and 1% potassium ferric cyanide were added and the reaction mixtures were incubated at 50 °C for 20 min. Finally to the tubes 2.5 mL of 10% TCA, 0.1 mL of 0.1% ferric chlorides and 2.5 mL of distilled water were added. The absorbance of each sample was measured at 700 nm using a spectrophotometer and the results were expressed in terms of μg (ascorbic acid equivalents) AAE/mg of extract by Padmanabhan et al., 2012 13. DPPH Radical Scavenging Assay: DPPH (1, 1-Diphenyl-2-picrylhydrazyl) is a stable free radical, DPPH reacts with an antioxidant or reducing compound and produces the corresponding hydrazine DPPH2, which is converted from purple to yellow colour by Blois 14 BHA (1 mg/mL) was used as standard. Plant samples (10 mg/mL) were taken and the volume was made up to 3 mL using methanol. 0.5 mL DPPH solution (500 μM) was added and incubated at room temperature for 45 min. The absorbance was read at 515 nm and the results were expressed in terms of IC50 values. ABTS Radical Scavenging Activity: Scavenging of ABTS a cation was evaluated using ascorbic acid as standard with slight modification in procedure of Re et al., 1999 15. Prior to the assay, the ABTS reagent was prepared by mixing 7 mM ABTS and 2.45 mM potassium persulphate and the solution was diluted with ethanol to get a blue-green chromophore with an absorbance of 0.700 ± 0.025 at 734 nm. The extracts (10 mg/mL) were added in different concentrations and the volume made up to 1 mL using distilled water. To this 1 mL of ABTS reagent was added and the samples were incubated at room temperature for 6 min. The absorbance was measured at 734 nm and the results were expressed in terms of IC50 values. a is the negative control without inhibitor. B is the activity with inhibitor. b is the negative control with inhibitor. Where Abs 1 is the absorbance of incubated solution containing plant extracts, starch, and amylase; Abs 2 is the absorbance of incubated solution containing plant extract and starch; Abs 3 is the absorbance of incubated solution containing starch and amylase; Abs 4 is the absorbance of incubated solution containing starch. Alpha-Glucosidase Activity: The inhibition of α-glucosidase was measured using 1 mg of α-glucosidase dissolved in 100 mL phosphate buffer pH 6.8 and 5 mM p-nitrophenyl α-D-gluco-pyranoside. Plant extracts at different concentration were premixed with 490 μL phosphate buffer pH 6.8 and 250 μL of 5 mM p-nitrophenyl α-D-gluco-pyranoside (p-NPG). After pre-incubation at 37 ºC for 5 min, 250 μL α-glucosidase (0.15 unit /mL) was added and incubated at 37 ºC for 15 min. The reaction was terminated by the addition of 2000 μL Na2CO3 200 mM α-glucosidase activity was measured at 400 nm by monitoring the quantity of p-nitrophenol released from p-NPG at 400 nm. The concentration of the extract required to inhibit 50% of α-glucosidase activity under the assay conditions was defined as the IC50 value. Cell Culture and Induction of Differentiation: 3T3-L1 pre adipocytes a mouse fibroblast cell line was obtained from National Centre for Cell sciences, Pune India. 3T3-L1 preadipocytes were grown in High glucose DMEM supplemented with 10% FBS at 37 °C in an atmosphere containing 5% CO2. To induce adipocyte differentiation, 2-days post-confluence 3T3-L1 preadipocytes (day 0) were incubated with (10 μg/mL insulin, 2.5 μm dexamethasone and 0.5 mM 3-isobutyl-1-methyl-xanthine) along with plant extract for 48 h (day 2). Then 10 μg/mL insulin was added up to (day 4) and media was changed every alternate day with plant extracts up to 8 days 18. Oil Red O Staining: Lipid accumulation in differentiated adipocyte was measured by oil red staining. Cells were washed with phosphate buffered saline and cells were fixed with 10% formalin for 1hour and stained for 30 min with 0.5% oil red stain in 100% isopropanol. Images were captured by Olympus microscope. The stain retained by lipid droplet was eluted by isopropanol and quantified by measuring at 510 nm. Triglyceride Estimation and Free Glycerol Release: Triglycerides in cell were estimated using commercially available triglyceride kit (Agappe diagnostics Ltd., Ernakulum Kerala India) according to manufacturer instructions. The cells were washed with PBS, scraped and lysed in homogenizing buffer (42 mM KCl, 1mM EDTA and 50 mM tris pH 7.4) and cell lysate was centrifuged at 3000 g for 10 minutes at 4 ºC. Supernatant was assessed for triglyceride content. Lipolysis was measured by commercially available free glycerol reagent after 24 h adipocyte differentiation with and without plant extracts. 50µl of the cell incubation medium was taken and incubated with free glycerol reagent for 15 min. The glycerol content was measured at 540 nm. Statistical Analysis: Data was expressed in mean ± SD. A significant difference between the groups was assessed by one - way ANOVA with Tukey's multiple comparison tests. P<0.05 was considered statistically significant by using GraphPad Prism 6.01 (La Jolla, CA, USA) software. Phytochemical Screening: The hydroalcoholic extracts of selected plants were screened for the presence of different phytochemicals which is shown in Table 1. All plants showed the presence of flavonoids and alkaloids. Amino acids were present only in Nigella sativa and Oryza sativa. Where saponins were absent in these plants. Tanins were absent in Triticum aestivium and all citrus peels. Where triterpinoids were absent in Triticum aestivium and Citrus sinensis. Phytochemicals play a role in the treatment of obesity through various mechanisms. Polyphenols have potential anti-obesity efficacy, they inhibit fat metabolizing enzymes pancreatic lipase, lipo-protein lipase, and glycerol phosphate dehydro-genase. Polyphenol extracts are able to decrease the blood levels of glucose, and lipid profile, increase energy expenditure and fat oxidation. Flavonoids are plant secondary metabolites; these have been previously reported that they play important role in inhibition of pancreatic lipase activity 19. Obesity is characterized by low-grade inflammation due to increase in mass of adipose tissue causing hypoxia which in turn secretes pro-inflammatory cytokines. This leads to cardiovascular diseases. The free radical scavenging capacity of herbal extracts inhibits oxidation of macromolecules thereby preventing various diseases which are related to stress, like obesity such cancer and cardiovascular diseases 20, 21. Cyperusrotudus and Nigella sativa showed highest polyphenolic content which is expressed as gallic acid equivalent. The flavonoid content was expressed as quercetin equivalent Cyperous rotundus and Citrus limon showed highest concentration of these phytochemicals compared to other plants are shown in Table 2. The antioxidant activity was analyzed by an array of in-vitro assay Cyperous rotundus and Citrus limon showed highest reducing power in comparison with other plants and the activity was expressed in ascorbic acid equivalent. There was dose dependent increase in quenching of free radical with the increase in extract concentration. 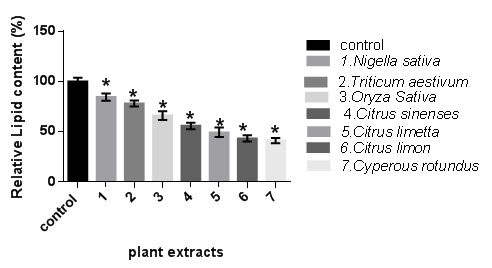 The results are expressed as IC50 values are shown in Table 2 Cyperous rotundus, Nigella sativa and Citrus limon exhibited stronger radical scavenging activity. Pancreatic Lipase Inhibitory Activity: Pancreatic lipase inhibitory activity was calculated using p- nitro phenyl butyrate as substrate with well-known standard drug Orlistat 22. The standard lipase inhibition was used as standard for comparison. There was dose dependent increase in inhibitory activity of lipase with increase in plant extract concentration. This was expressed as IC50 value. Our results suggest that Cyperous rotundus (1.1 ± 0.25 mg) Citrus limon showed (1.3 ± 0.56 mg) and Nigella sativa (1.8 ± 0.4 mg) respectively in Table 3. Inhibitory Effect on Carbohydrate Hydrolyzing Enzymes: The hydrolysis of starch to disaccharide and then monosaccaride is carried out by alpha amylase and alpha glucosidase. The inhibition of this enzyme by the plant extract was studied Table 3. It was found that Cyperus rotundus and Nigella sativa showed highest inhibitory activity. Alpha amylase is a digestive enzyme secreted by the pancreas and salivary glands which breakdown starch to disaccharide and alpha-glucosidase is carbohydrate hydrolysing enzyme secreted by brush border cells of the small intestine which converts disaccharide into monosaccharides 23. 3T3 -L1 adipocyte cell line serve as in-vitro model system to study anti-obesity activity because it differentiates from preadipocyte to mature adipocyte which is specialized in the accumulation of lipid droplet upon treatment with cocktail insulin, dexamethasone and IBMX. Our results indicate the 125 µg/ mL of Cyperus rotundus show significant reduction in lipid droplet accumulation followed by Citrus limon in Fig. 1. Interestingly 125 µg/ mL of Nigella sativa induced adipogenesis instead of inhibition. This may be due to excess uptake of glucose and conversion to triglycerides. 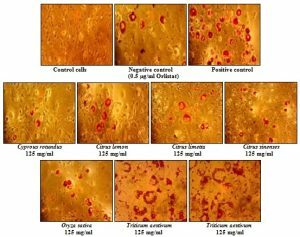 Our results correlated with previous studies where in Nigella sativa treatment of preadipocytes undergo differentiation with excess accumulation of triglyceride compared to treatment with 10 μm rosiglita zone standard drug. It was attributed that Nigella sativa showed insulin-like properties and anti hyperglycemic activity 24, 25. Oil red staining elucidated the lipid droplet accumulation in 3T3 l1 cell line. In negative control we could observe accumulation of lipid droplet. Where in positive control orlistat there is reduction in lipid droplet accumulation. Different Plant extracts of same concentration (125 mg/mL) were added in culture flasks. Triticum aestivum and Nigella sativa did not show inhibition in lipid droplet accumulation. While Cyprus rotundus showed lowest accumulation of lipid droplet. Fig. 3: Triglyceride accumulation was assessed in differentiated cells with and without plant extracts data represented as SD ± n= 3 *p≤0.05 vs control and # p≤0.05 vs negative control. Lipolysis was assessed by estimation of glycerol release in medium data represented as average SD ± (n= 3) # p<0.05 vs negative control. After 8 days induction of adipogenesis, triglycerides were estimated compared with negative control and positive controls (Orlistat). There was a significant decrease in triglyceride content in treated group triglyceride content in Cyprus rotundus, Citrus limon and Citrus to limetta compared to negative control. Lipolysis was assessed by estimating the free glycerol released into the medium. Treatment of plant extract seemed to increase in lipolysis suggesting that these plants have anti-obesity efficacy. Adipogenesis was measured by triglyceride content in cell lysate and lipolysis was measured by free glycerol release in the medium. 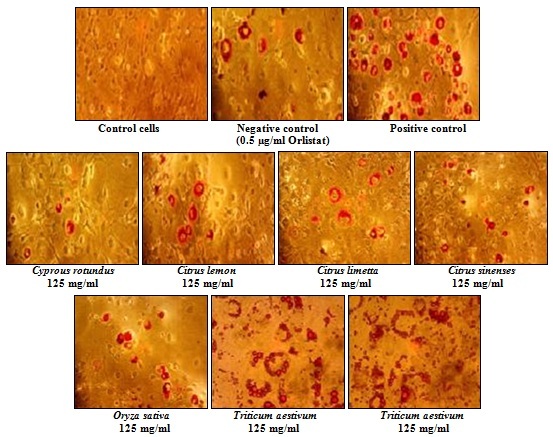 125 µg/mL medium of Cyperus rotundus showed decreased level of triglyceride content and increased lipolysis as assessed by free glycerol release followed by Citrus limon Citrus limatta, Citrus sinensis, Triticum aestivum L, Oryza Sativa and Nigella sativa. Thus indicating that these plant extracts exert lipolysis release of glycerol in medium and inhibit triglyceride accumulation. CONCLUSION: The preliminary screening study indicates that Cyperus rotundus and Citrus limon found to be potent herbal approach for treatment of anti-obesity by inhibiting lipid and carbohydrate metabolizing enzymes compared to other plants. Inhibition of triglyceride accumulation and increase lipolysis by reducing of adipogenesis compared with standard drug orlistat in 3T3 L1 cell line. Thus our study provide new arena for treatment of obesity. ACKNOWLEDGEMENT: The authors provide immense full thanks to R. K. Sharma Director, DFRL, Mysore for providing necessary facilities to carry out work. CONFLICT OF INTEREST: The authors have no conflict of interest regarding the publication of paper. Sahib GN, Saari N, Ismail A, Khatib A, Mahomoodally F and Hamid AA: Plants' metabolites as potential antiobesity agents. The Scientific World Journal 2012. Sun K, Tordjman J, Clément K and Scherer PE: Fibrosis and adipose tissue dysfunction. Cell Metabolism. 2013; 18(4): 470-7. Luo L and Liu M: Adipose tissue in control of metabolism. Journal of Endocrinology 2016; 231(3): R77-99. Giralt M, Cereijo R and Villarroya F: Adipokines and the endocrine role of adipose tissues. In Metabolic Control 2015; 265-282. Springer, Cham. Torres-Fuentes C, Schellekens H, Dinan TG and Cryan JF: A natural solution for obesity: Bioactives for the prevention and treatment of weight gain. A review. Nutritional Neuroscience 2015; 18(2): 49-65..
Mohamed S: Functional foods against metabolic syndrome (obesity, diabetes, hypertension and dyslipidemia) and cardiovasular disease. Trends in Food Science and Technology 2014; 35(2): 114-28. Salvadó MJ, Casanova E, Fernández-Iglesias A, Arola L and Bladé C: Roles of proanthocyanidin rich extracts in obesity. Food and Function 2015; 6(4): 1053-71. Zhang B, Deng Z, Ramdath DD, Tang Y, Chen PX, Liu R, Liu Q and Tsao R: Phenolic profiles of 20 Canadian lentil cultivars and their contribution to antioxidant activity and inhibitory effects on α-glucosidase and pancreatic lipase. Food Chemistry 2015; 172: 862-72. Varinli H, Osmond-McLeod MJ, Molloy PL and Vallotton P: LipiD-QuanT: a novel method to quantify lipid accumulation in live cells. Journal of Lipid Research 2015; 56(11): 2206-16. Bankole AE, Adekunle AA, Sowemimo AA, Umebese CE, Abiodun O and Gbotosho GO: Phytochemical screening and in-vivo antimalarial activity of extracts from three medicinal plants used in malaria treatment in Nigeria. Parasitology Research 2016; 115(1): 299-305. Kapoor LD: Handbook of Ayurvedic medicinal plants: Herbal reference library. Routledge 2017. Bursal E, Köksal E, Gülçin İ, Bilsel G, Gören AC. Antioxidant activity and polyphenol content of cherry stem (Cerasus avium) determined by LC–MS/MS. Food Research International 2013; 51(1): 66-74. Padmanabhan P and Jangle SN: Evaluation of DPPH radical scavenging activity and reducing power of four selected medicinal plants and their combinations. International Journal of Pharmaceutical Sciences and Drug Research 2012; 4(2): 143-6. Blois MS: Antioxidant determinations by the use of a stable free radical. Nature 1958; 181(4617): 1199. Re R, Pellegrini N, Proteggente A, Pannala A, Yang M and Rice-Evans C: Antioxidant activity applying an improved ABTS radical cation decolorization assay. Free radical Biology and Medicine 1999; 26(9-10): 1231-7. Kim J, Jang DS, Kim H and Kim JS: Anti-lipase and lipolytic activities of ursolic acid isolated from the roots of Actinidia arguta. Archives of Pharmacal Research 2009; 32(7): 983-7. Xiao Z, Storms R and Tsang A: A quantitative starch-iodine method for measuring alpha-amylase and glucoamylase activities. Analytical Biochemistry 2006; 351(1): 146-8. Roh C and Jung U: Screening of crude plant extracts with anti-obesity activity. International Journal of Molecular Sciences 2012; 13(2): 1710-9. Rahim AT, Takahashi Y and Yamaki K: Mode of pancreatic lipase inhibition activity in-vitro by some flavonoids and non-flavonoid polyphenols. Food Research International 2015; 75: 289-94. Kim MJ, Park M, Jeong MK, Yeo J, Cho WI, Chang PS, Chung JH and Lee J: Radical scavenging activity and anti-obesity effects in 3T3-L1 preadipocyte differentiation of Ssuk (Artemisia princeps) extract. Food Science and Biotechnology 2010; 19(2): 535-40. Das TT: Role of Antioxidants in Health and Diseases-A Review. Research Journal of Pharmacy and Technology 2015; 8(8): 1033. Gilles MA, Frank NE, Tatsadjieu L, Nicolas NY and Mbofung CM: Assessment of in-vitro inhibitory effect of khaya tea infusion on porcine pancreatic lipase activity. Biosci, Int. J. 2015; 6655(6): 1-9. Barrett AH, Farhadi NF and Smith TJ: Slowing starch digestion and inhibiting digestive enzyme activity using plant flavanols / tannins - a review of efficacy and mechanisms. LWT-Food Science and Technology 2017. Benhaddou-Andaloussi A, Martineau LC, Spoor D, Vuong T, Leduc C, Joly E, Burt A, Meddah B, Settaf A, Arnason JT and Prentki M: Antidiabetic activity of Nigella sativa. Seed extract in cultured pancreatic β-cells, skeletal muscle cells, and adipocytes. Pharmaceutical Biology 2008; 46(1-2): 96-104. Yuliana ND, Iqbal M, Jahangir M, Wijaya CH, Korthout H, Kottenhage M, Kim HK and Verpoorte R: Screening of selected Asian spices for anti obesity-related bioactivities. Food Chemistry 2011; 126(4): 1724-9. Fathima A, Khanum F and Ilaiyaraja N: In-vitro anti-obesity efficacy of selected plants in 3T3-L1 cell line. Int J Pharm Sci & Res 2018; 9(11): 4666-73. doi: 10.13040/IJPSR.0975-8232.9(11).4666-73.